Just as A'Runda was about to strike he hear another voice call out to him. Stopping, he looked over and saw another first order force user. He must've been to distracted with the one before him he didn't notice the one that came up from the side. Glaring at the man through his mask, the Tusken lowered his saber. His body now facing between the two other force users. Looking at the two of them as he turned his head. "Then what, I don't expect anything better then a death sentence. I've heard of you Forst Order types." A'Runda replied to the newcomer. It was clear that from his posture they were no better then an amateur. Holding his saber down low in one hand. "Another thing, you bargaining skills are worse then a Jawa's. Cause I'm sure going against the wishes of the first order are far worse then any warped idea they have of mercy given the way you treat those you oppose in the galaxy. Or do you plan to take me under, where I'm nothing more then a glorified droid for the Supreme Leader like yourself." A'Runda's tone was quite clearly harsh, and trying to aggravate them. He was sure with words like that he wasn't getting on their good side. Yet he stood ready for whatever they had in store. Jim looked around the situation was quickly escalating to the point where even if his ship did come, it wouldn’t help he needed to buy more time. Another marking force user had showed up. They had to go and quickly. Jim thought of ways to distract the guard. There wasn’t much to come up with, he’s better equipped and far more armored than he is. 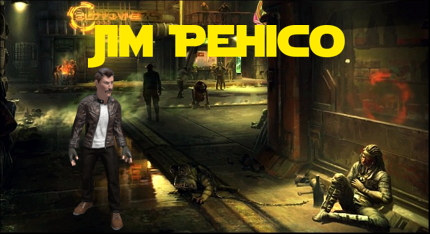 Jim’s only hope is that he caught him off guard. The moustachioed miscreant whispered over to Skye. “I appreciate you trying to get me out of this, but I’d rather die than see you become a slave to the First Order.” He winked at her confidently. He looked over to the trooper and said “Well, since you clearly defeated us rebel scum, let us have a toast to the victor.” Jim said as he slowly reached into his pocket to grab his flask. He then continued to raise it. “To FN-... hmmm... what is it again?” Jim asked. Before the trooper could react to his question, Jim threw his flask at the trooper, hitting him in the head, and making him stagger only momentarily, Jim quickly got onto his feet and tackled the trooper, knocking his blaster out of his hands away from him. Jim wasn’t a great fighter, he’s barely win in a bar fight, but all he has to do is take a beating until his ship got here, and that’s what he was planning what to do. Jim got up and he threw the first punch. He aimed right at his stomach with an uppercut. WHACK! nothing happened to the soldier, but Jim’s hand was throbbing in pain. He grabbed his hand and winced in pain, “Oh kark that hurt!” He had forgotten how hard stormtrooper armor was, and he paid the price. He backed up quickly and put up his hands. “Come on plastic boy, let’s dance!” Jim said trying to play off the fact he was about to get smacked around. Edited by Jim Pehico, 18 January 2018 - 08:31 PM. Guilt, shame, regret. Most of the time those emotions were foreign to the young Knight. Pity. Yes, sometimes Varas felt pity. But it was not strong enough to take any steps towards mercy. Once the backup arrived, Varas eyed the trooper and Oregano, a Disciple who she’d trained with on Hoth. Striding confidently through the streets, the stormtrooper dispersed the crowd with an efficient bellow. The only ones who remained were the troublemakers and those who hunted them. Aiming his blaster at the Force-weak girl and her male companion, Varas, safe in the knowledge that he had them under control - the brunette clone would have preferred to execute them on the spot, but it was not her decision to make - turned her attention again to the Tusken Raider. Disciple Oregano called to the sandman to put his weapon down. She gave him a curt nod. And as soon as he lowered it, the brunette clone sprung again, rushing up behind the Tusken Raider with a low swing of her crimson saber, attempting to slice his torso from kidneys to lung. Only a determined, canine grunt accompanied her sudden attempt to kill him. A'Runda felt like he should expected them to play dirty after he lowered his saber. As what felt like an instinctive reflex, the force aided in his attempt to defend himself. He shifted his body and jerked jerked his arm up and had his lightsaber pointed down. All just to block and swat the crimson blade away from him. However, it wasn't perfect, and he was still pretty new to saber combat. So he blade did manage a less severe cut into his side. "Trrru'uunqa!" He shouted in his more native tongue. The Tusken stepped back away from the two of them. He was clearly out matched. A'Runda reached down to check his wound, but flinched from how hot it still was. The cut now given more way to channel the dark side in him. Taking another step back he eyed the two more disciplined force users, taking a more defensive pose. "I knew you didn't have any mercy" He hissed, by now he was really hoping that the two he stepped in for could get themselves out of this mess. First, Skye confusedly turned her head and looked over at the man, Jim Pehico. She looked at him with fear and confusion. It was only when she turned her head back towards the Tusken that she saw the source of her discomfort, Oregano . Luckily, after not too long she was released from his grip, whether it was because she had been fighting the man's grip or just because he let her go, Skye didn't know. She fell on her knees and arms, panting quickly with a few coughs here and there. After she caught her breath, she returned her attention to the man, who now seemed to be fighting FN-2826 . Originally, she had wanted to get out of this relatively easy and without too much conflict, or not at all. However, the display of Varas Kyrel, and the introduction of Oregano even more, made the fear she had of returning to the Order even bigger. She feared only two things could happen. Either she escaped, or she'd be executed. That wasn't necessarily the truth, but it was to her. "Not like I have much of a choice anymore", she muttered to herself while she slowly got on her feet. "Alright, alright", she whispered before she fixated her gaze on the trooper with who her 'partner in crime' was fighting. She aggressively exhaled, trying her best to use her own anger, before she suddenly rushed towards the trooper and jumped into his waist in an attempt to tackle him. Edited by Skye Achlys, 20 January 2018 - 03:05 PM. Tempest had been thinking about the woman's remark to him, the idea imprinting a smile on his face from under his helmet. A promotion...now that did sound nice, it was something Temp wanted, no needed. Though due to thinking about the woman's idea, it left Tempest dumbfounded by what had happened next. He didn't know what had hit him as he was thrown to the ground, his rifle being thrown from his hands. He hadn't been able to process anything that had just happened. Though, he did quickly come to his senses as he felt an unarmored punch hit against his chest plate.So, it was a fight they wanted? Well, it was a fight this drunk scoundrel wanted. Either way, it didn't matter, this man looked untrained...and he stank of alcohol. Temp believed that it would be quite easy to take the man down without his gun. There was no viable reason to bring a gun into a fist fight, plus it would just get in the way. Tempest wanted to make the man suffer for his insolence for both attacking him and helping the prisoner, Skye, escape custody. "So If I'm plastic...and you got hurt from punching me, what does that make you? The paperboy?!" The voice of Tempest barked mechanically yet with humor in it as well as it went through the voice modulator in his helmet. "Please, you're no threat. You're just a drunk, a scoundrel with no allegiance to anyone or anything except to your own salvation. I'm surprised you haven't just decided to run off yet, being the scoundrel time, you people...you're cowardly, you're like vermin...running at the slightest hint of trouble!" The voice of Tempest barked again, though harsher and fiercer than before. He was pissed at being attacked, being attacked by a cowardly drunk no doubt. The waxy, gloved right hand of Tempest reached down, pulling a rather nasty looking ballistic knife from a sheath on his belt. He was meaning to stab the drunk who had just attacked him. Though, before he could do anything, he was tackled to the ground again by the prisoner. In a panic, Tempest brought his knife sharply upwards towards the woman's stomach, the same woman who was now laying atop of him from tackling him to the ground just moment's earlier. He wasn't entirely sure if the First Order needed her back dead or alive...though if they needed her back alive, she'd be injured of course. Temp would see to that now. It was a simple reflex, Skye immediately grabbed the troopers hand which held the knife, and forced it against the ground. "Not a chance", she hissed to his face. Even though Skye should definitely be able to defeat this man in hand-to-hand cocomb- hell, she should even we able to do it one handed with the training she'd had, yet she found herself struggling to keep the knife away from her. Even though she had been trained almost all her life, she'd never had to truly fight for her life, so she found her own fear quickly weakening her a lot. In an attempt to open a brief window, she suddenly rolled off the trooper and on her back beside him. This gave her a slight break away from his knife, but it also gave him the opportunity to get on her and pin her to the ground. "It's two versus one. You /will/ lose. Give up, and we won't harm you", she bluffed. Edited by Skye Achlys, 21 January 2018 - 08:39 AM. Edited by Skye Achlys, 21 January 2018 - 08:38 AM. Edited by Skye Achlys, 21 January 2018 - 08:37 AM. Jim put his hands up as the trooper threatened to gut him like a nerf. Jim had brought nothing to a knife fight. Fortunately his new comrade Skye caught the trooper by surprise and tackled him. “Everything was under control!” Jim said. He quickly picked up the flask he threw at the trooper and put it back in his jacket pocket. His ship should be here any moment in the meantime he had to know when his ship would be there. “Threasy, where are you buddy?” He said into his commlink. The droid whistled back nervously. “A minute out? You better be.” Jim said into the commlink. He then rushed over to help Skye who had just rolled onto her back. Edited by Jim Pehico, 23 January 2018 - 09:46 PM. Skye quickly crawled back towards Jim Pehico and away from FN-2826 . Refusing to look away from the trooper, she whispered towards the man who came to help her, "Please tell me you were talking to someone who can help us." Her expression noticeably saddened. "Because if we don't make a move right now, they'll overwhelm us within seconds- or minutes at best." "And you", she told the trooper, a bit louder, "think about my offer. You can still walk away. You can still keep laying there. Just pretend I knocked you out", she huffed. She really hoped the stormtrooper would give up and she had talked him down, but she feared it wasn't that easy. She caught a quick glance at Varas Kyrel , who was more than occupied with @A'Runda and Oregano . Seeing that gave her slight hope; if the trooper could be dealt with, they might be able to slip away without the brunette even noticing them. The Tusken clumsily batted her away, but even awkward, the move was successful, and the brunette clone jumped back a few paces, if only to put some space between her and her opponent. Varas glanced briefly at the young fugitive woman and for some reason, maybe a latent memory surfacing from her mother Tmoxin, she felt sorry for her. If the dark-haired girl was lucky, she’d be taken back and possibly spared her life… possibly. If she wielded the Force, she was indeed an asset, despite the strict adherence to obedience that was being a Ren. Or maybe she was more lucky if she were to be executed. For a split second, Varas felt the deepest conflict inside her. And unexpected, she telepathically sent a message to the girl: Run, run while you can. There’s nothing but war and misery here. And then the discord was gone. The Tusken was injured and bloodlust fueled her. She drank it in like a heady wine. The darkside in this sand person? It surprised her. She raised her saber in a more defensive position now and waited. Edited by Varas Kyrel, 24 January 2018 - 07:12 AM. Once more, a shiver ran down Skye's spine, but this time for a different reason. Not because she still feared the voice, no, this time it was because of the message it delivered. War and misery, words that triggered multiple alarms inside Skye's mind. If even this woman was telling her to leave, how horrible must it all be? Even though she was clearly scared by the display, she still found conflict inside herself too- but that didn't matter now, she had to escape. Act now, think later. As a result of all this, she started to slightly shake, which could also be heard in her voice. She looked up at Jim with wide eyes. "We need to run. Now. Run! ", she exclaimed without thinking, simply repeating the last part of the brunette's message. She slowly got back up while trying to keep her eyes on both Jim Pehico and FN-2826 at the same time. She could feel the big moment approaching: escape, or be either imprisoned or killed. They had already been extremely lucky they were still in such a fortunate position and that they had not been overwhelmed with stormtroopers already. Unfortunately, if they didn't act now, they were very likely to be overrun after all. Jim was almost certain death was imminent. Good bye cruel world he said along with his prayers.. Suddenly out of the clouds in the sky appeared a low flying G-9 light-class freighter it was the Roska. The ship shot down at the ground bringing up bits of the street and smoke up with it trying to force the First Order to be distracted. “Thank the force, it’s Threasy.” He said to himself as the ship landed near Jim and Skye. The ramp slid down and this caused Jim to sprint to the ramp. “C’mon!” He yelled to his new comrades. Did her own eyes betray her? No, it was real. A ship, an actual ship landing right here. Skye didn't wait a second, or maybe she did, just one; she quickly glanced over her shoulder at Varas Kyrel once more before she darted towards the ship. She held her arms in front of her face to attempt to block the rubble and smoke flying in her face. She was not too far behind Jim Pehico , but also not as close as she'd like to be. "Keep going! ", she yelled to the man. If she had to be honest, Skye felt horrible because of all the troubles and danger she had created today. She didn't want to see Jim Pehico harmed because if she did, she would surely blame herself. She had hope that she would reach the ship and thus escape, but deep inside her she had the realization that there were 2 force-users present here that were against her. One of them Skye knew to be very powerful as well, the brunette. A'Runda flinched some as the ship appeared overhead shooting down at them. At first he thought it was the first order. Then he realized that it wasn't as sleek. Looking back he watched as the two sprinted to the ship. The Tusken himself considered jumping on with them, but he heard the words of Varas Kyrel and he didn't want to run from this fight. No matter how badly it would turn out for him. With a heavy head he looked down for a moment. He wouldn't go with them, the best he thought he could do was hold them off. If anything he was the greater threat now. After that he looked back to the force user in front of him. Standing a defensively before him. With little hesitation he began to spin and swing his crude, purple light saber. It giving off a low hum as it moved, sparking and crackling the whole time. After gaining some momentum he went at the other dark side user. Striking at her, surly the more disciplined force user could block and doge his attacks. But she should be able to tell that they were heavy, determined attack. Letting her see what he could do. Did they really think they could just escape that easily? For the time being he was keeping eye on the one with a lightsaber as he seemed the most dangerous at the time. With the descent of a ship however things changed. He was given some options, go for the ones trying to escape or double team the Tuskan. After a moment of thought he was confident Varas could handle the Tuskan on her own as he turned towards the two heading for the ramp of the ship. He needed to cut them off from reaching the ship however they were too far ahead of him. Was it possible he could force the ramp back up? No, they could likely jump and reach the ramp before it shut completely. With his force push he could only stop one of them. The girl. She was more dangerous and had to be stopped. Oregano took a step towards her and extended his left hand at her, palm open. From there he would attempt to send a blast of some sort of energy towards her in an attempt to push her towards the side, away from the ramp, and doing so would allow Oregano to close the distance between them and get close enough that if she got up he could intercept her before she reached the ramp. Jim however would find himself lucky as nothing was stopping him from boarding the ramp. "Alright, now it's just you and me. Don't think I'll just let you leave easily." The boy then raised his right arm and pointed his crimson blade towards her threateningly. She was so close, yet so far away. Skye gave a short yell when she suddenly got flung through the air, in the worst direction possible. She gave a low grunt when she hit the ground and followed it up with a sarcastic comment, "You couldn't have just flung me into the ship or anything, could you?" She slowly got on her knees, but in the process she saw the man closing in on her. She wasn't going to make it to Jim Pehico 's ship. That's were she had to face the facts; she was vastly under-equiped and she had terribly underestimated the manpower that had been deployed following her escape. She quickly looked over her shoulder towards the man and the ship before sighed. She turned her head forward again as she slowly stood up, facing Oregano . "Funny, that blade you're pointing at me. I'm not particularly armed or anything", she told him, half speaking the truth and half lying. She wasn't armed with anything special, but she did have a stun baton and a small knife just in case the situation callled for her to use them. Skye gave herself a few more second to think about it, before she eventually put her hands in front of her and in the air, as if she was surrendering. Whether she really was, she didn't even know herself. She probably was, even if it was just to give the man enough time to escape and to hopefully make them spare the Tusken as well. She couldn't help but feel horrible guilty for dragging them into this, and she started to feel guilty for killing those two troopers too. Yes. She'd surrender so that she could fix what she did wrong. She endangered many lives today. "Fine", she mumbled while she kept her hand in the air. She didn't drop her guard however, she was still keeping her eye on both the man pointing his blade at her and the woman in the distance, Varas Kyrel . Skye still didn't trust her. Neither did she even know for sure if they still wanted her alive. She thought they would, but couldn't be sure. Edited by Skye Achlys, 16 February 2018 - 05:12 PM. Zyrias exited the cantina, a bit tipsy, but ready to find something fun to do. It was a week before she and the mercs - all expenses paid by their benefactor -were going to try and break out Team Meridian from a First Order prison. Death Row inmates even. This was the game - trading lives for lives apparently. Someone will die in this mission, and hopefully it won’t be me, mused the Canto Chameleon. In the meantime, she was ready to get good and karked up in this kinda lame city on a First Order world. But perhaps more excitement brewed ahead as Zyrias came upon some kind of altercation. She had managed to avoid, not just the Jedi that patrolled the galaxy like militant peacekeepers, but any Force users for that matter. But a part of her was sure this was not a normal bar fight that had spilled out into the streets. Might as well spend what you got when you’re constantly staring into an early grave.